First details have revealed that Lara Croft and the Guardian of Light will be a departure from the Tomb Raider games its star is known for. Lara Croft and the Guardian of Light was first announced earlier this week, but with very little details. A videogame starring Lara Croft with the absence of "Tomb Raider" in the title was a notable mystery, causing speculation as to how it was going to play, or if it would even be a new Tomb Raider game at all. New information has emerged thanks to a first look over at GameSpot, confirming that Crystal Dynamics is indeed trying out a new style of gameplay, but still bringing Lara Croft along for the ride. Guardian of Light will take place in environments similar to that of the earlier Tomb Raider titles, but will now feature co-op gameplay with a fixed overhead isometric camera. The story is fairly straightforward "find the artifact, battle an ancient evil" fare, but the game mechanics are more about arcade-style, fast-paced combat, along with Legend of Zelda-esque puzzle solving. The game's co-op stems from Lara Croft's team-up with a Mayan tribesman named Totec. Lara still wields dual-pistols, while Totec uses spears and a shield. 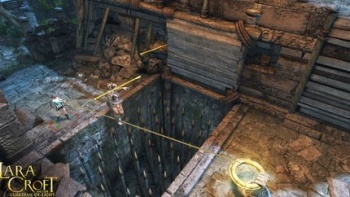 Each character has different abilities that can be used to get past certain puzzles: spears can be thrown into walls to be used as a steps, and Lara's grappling hook allows passage over chasms. The game can be played in single-player mode, but co-op is available both locally and online. It sounds like Crystal Dynamics has broken Tomb Raider down to its core elements, puzzle solving and combat, but also added a co-op function that allows the game to function similar to something like Trine or The Lost Vikings. Crystal Dynamics has called Lara Croft and the Guardian of Light "a truly original digital experience." I'm not sure that's quite what this is going by the new details, but it could be an interesting game nonetheless. Gamers might just have to get used to the much harder-to-see isometric boobies.